My dads genes...so many memories of what is to come. Each day, now 10 yrs from diagnosis, presents new challenges, and down times too. One eye is no TV, the other eye is half a frame. I am not a TV addict, and turn to talking books - my SANITY SAVERS. I love them. I look to the future, knowing next year I will not be shopping alone again; I'll always be with someone. Tis hard, walking around shopping malls, not seeing faces at all, hoping anyone knowing me will advance to me. There are voices saying 'hello' to me but I don't see their face. I MUST keep being independent if I can. MODERN TECHNOLOGY, in computers, I am so lucky I have that, enlarge, zoom, magnifying mouse, I love my mouse, and the printer amazingly prints off normal size! As life progresses, so does all this technology. I Google words and find more. I do not know anyone with this retinal eye disease. I just wish I could find a companion to exchange new findings with. I am 77 years of age. Sometimes I walk into a dark (to me) room, and see my husband reading the daily paper - "in the dark" I say! Not so he says. I am adapting to this dark world, and the world outside is often just a white fog. Little bumps on switches, remotes, phones, no straight lines anymore. We, who have macular degeneration, live in a different world don't we...but...I do laugh at all the crooked fences I pass,lamp posts 'leaning over' that only I can see. Let us laugh or there would be tears. Thank you Elva for sharing not only your story but your heart with us. What device do you use for listening to your talking books? I am 57, a widow, and still need to work. 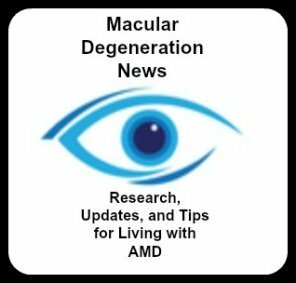 I have wet macular degeneration in my left eye and dry in my right eye. It has been a year since diagnosis. Avastin, eyelea and lucentis - I have had them all. Cold laser four times and I have tried accupuncture. Five doctors and I am still lost and scared. And I have blurry vision. My independence is going away and I don't know what I am to do. I am a paralegal and I draft and read documents all day long. What now? A year later, fast progression now, the world changing, as one eye will not behave now, and the other sees only first 2 numbers or letters, jumbles them all up to confuse me. Luckily I have a husband who can read out the phone numbers for me one by one as I dial, as no matter how huge I cannot read them, just 2 on one side of words etc. once more I am so thankful for emails, for the magnification produced by my MAGIC program, especially when it reads to me, and I cannot argue with it. So very lucky. I no longer can venture out alone, but there is always a friend willing to take me out for coffee and the welcome 'lady' chat and laughter. My Sanity saver books are always beside me,talking to me too. Through all the frustrations, downs etc I admire so much the totally blind, their abilities, their confidence, and tell me what I am dong wrong, how to 'learn' by touch, by sound. I feel so fortunate in having the peripheral vision MD provides; not always distinct, but it is there, as I pat the guide dog of a friend, knowing that dog has so much caring knowledge. along the road of modern technology - the downs become ups. ..ELVA ADDING to my story of macular degeneration. I now visit Sightloss Services in Auckland, and Magnifiers and More...I walk in there feeling 'this is my future' everything I will need in the future, everything talks. I can just walk in and I am shown all the wonders there. I can buy or keep in mind for when the stage comes that I need more help with visula aids. We are so lucky to be in these days of technology. I feel as I stand and feel 'a positive future right here. Doubts, frustrations, and 'downs' all go. I then admire the truly blind who cope these new devices so well..as they enter a new world regularly. LESLIE ASKED what device I use to listen to talking books. Easy, Leslie, I visited the local shop selling earphones, etc. and got a neat set of ear phones. They just plug into the side of the talking book player. TV going, so I put on my earphones, which also has an up/down switch for sound, as well as the player which has these buttons too. I am happy, the TV can carry on and I get into my book world. When alone in the house, I do not need aids, I just have it where I am or carry it around and listen. A sanity saver ..definitely. And the earphones are in all sizes, over ear or in ear plugs. Over hearing aids in my case, or take them out and use plug in ear ones. They are not expensive.